A bald-headed doctor is taking a patient’s pulse. During the Edo (1603-1868) and early Meiji Period (1868-1912), Japanese physicians shaved heir heads. This studio re-enactment of a doctor’s visit shows him sitting next to his medicine case and a sword. Apparently, doctors carried wooden swords to accentuate their high status in society. They shaved their heads because medicine were originally administered by Buddhist priests. The image appears to have stuck. 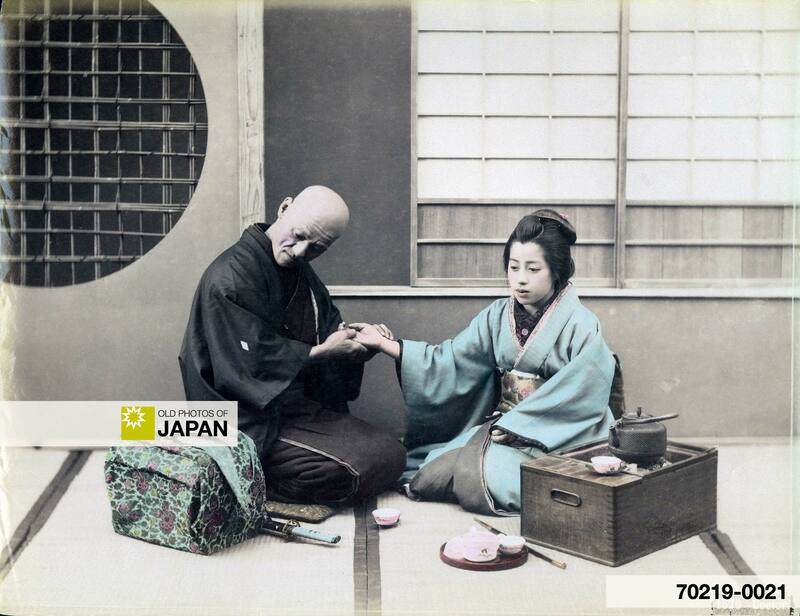 His young female patient sits next to a hakohibachi (箱火鉢), a brazier encased in a wooden box. In front of the box lies what appears to be a kiseru pipe and a tray of tea cups. You can also licence this image online: 70219-0021 @ MeijiShowa.com. There was something about that sword that kept me thinkig why all the photos with japanese doctors contain this element. I found out that sword owned by a doctor was called bokuto. Bokuto has no blade and is merely a piece of lacquered or sculpted wood, decorated to a greater or lesser extent and curved like a dagger. The sword on the photo might not be a real bokuto but it significant part of doctor’s equipment. Thanks, Agata, for the great link. I actually checked with somebody who is very familiar with Edo Period Japanese medicine and he also mentioned that it was common for doctors to wear swords. According to him they shaved their head because originally Buddhist priests administered medicine and the image seems to have stuck. Bokuto is written 木刀. It literally means wooden sword.